The planet of double suns, Tatooine looms large in the mythos of Star Wars. The setting for the first act of A New Hope and Return of the Jedi, the second act of The Phantom Menace and Attack of the Clones, and part of the concluding final act of Revenge of the Sith. Only The Empire Strikes Back and The Force Awakens avoid returning to a planet described by one bored farmboy as, “If there’s a bright center to the universe, you’re on the planet that it’s farthest from.” Luke Skywalker’s less than thrilling description of his home isn’t far off the mark, given its placement in the Outer Rim, the farthest reaches of the Star Wars galaxy, where law and order begin to break down. Controlled by the Hutt crime syndicate, we visit two cities on the dusty surface, Mos Eisley and Mos Espa, both which fail to offer anything but scum and villainy. And yet, this is the setting that George Lucas elected to place his hero, Skywalker. Nominally, in American tradition, when we do have a hero come from an agricultural background, it’s intended to draw upon a quintessential American idea that somehow the hinterland is a place where certain moral values are held in greater esteem. In short, our heroes come from places of virtue, and part of their heroic nature is built upon their possession of these virtues. The best example of this is none other than Clark Kent, the all-American farm boy who leaves middle of nowhere Kansas for the big city to become a hero. Even in the comedy, Cheers, the character Woody Boyd, while not necessarily portrayed as the sharpest tack, comes from an agricultural background in rural Indiana and bequeathed with values that often work against the norm in urban Boston. So again, why does Luke Skywalker’s planet of origin stink royally of everything counter to the virtues we look to for heroes in similar shoes? One potential answer could be to simply highlight Skywalker’s own virtues. A glance at the standalone Obi-Wan Kenobi stories in Marvel’s Star Wars comic line definitely lends some strength to this argument. In those issues, which, granted, are colored by an understanding of Luke nearly three decades in the making, we see a young man who recognizes unfairness and acts to correct it. In one instance, challenging Jabba the Hutt’s goons who have been collecting a burdensome water tax on the moisture farmers in the midst of a drought. As a result, for the purpose of creating a hero for the narrative, Lucas may have wanted him to rise from a bed of weeds, per se, than roses. 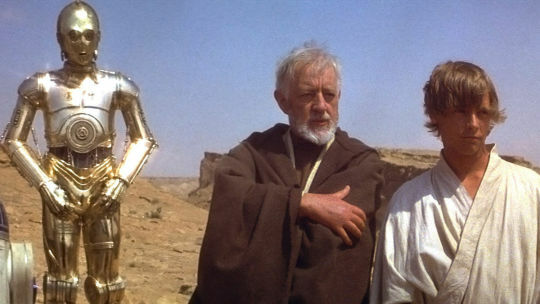 This doesn’t explain, however, why the films return to Tatooine beyond A New Hope. Before we look further into the sandy planet in the original trilogy, we can much more clearly comprehend its role in prequel trilogy. The presence of the planet in the prequel trilogy is straightforward because of the idea of character and momentum. 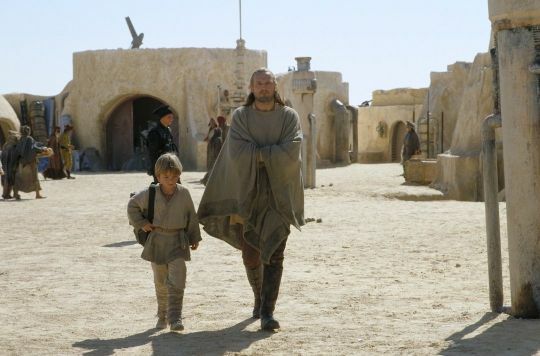 Tatooine, because of A New Hope, was established as the birth place of Luke Skywalker’s father, Anakin. Thus, Qui-Gon Jinn, Obi-Wan Kenobi, and Queen Amidala, were always predestined by the story of the first three films to seek a replacement hyperdrive engine on Tatooine after busting through the Trade Federation’s blockade of Naboo. But, wait, there’s more to Anakin Skywalker and his character that reinforced the presence of the planet, and we can quite honestly refer to it as immaculate conception. The role of Anakin Skywalker, as the one prophesied to bring balance to the Force, originated in The Phantom Menace. Lucas, to imbue his prophesied character with extra spiritual importance, opted to have Anakin essentially be born the child of the Force and Shmi Skywalker. Much of the world has read about a similarly prophesied child born in similar circumstances, Jesus of Nazareth. By drawing the comparison by birth to Anakin Skywalker and Jesus of Nazareth, Tatooine by its own geography, a hot dusty place, can additionally reinforce this message by paralleling the geography of the Middle East. It also resembles the popular conception of Egypt, where another great spiritual leader was born into slavery, like Anakin. That man’s name was Moses. So for the purposes of doubling down on the invocation of Anakin Skywalker, prophesied one, Tatooine works remarkably well for those with knowledge of Judeo-Christian background or knowledge (which constitutes a great majority of the United States’ population). Our Tatooine Mary, so to speak, is also the reason we return in Attack of the Clones. When Anakin bids farewell to his mother, he promises he will return to free her from her enslavement, and like that, a plot string is left dangling with a flashing neon sign screaming, “YOU’D BETTER PICK THIS UP LATER!” In Attack of the Clones, that’s exactly what happens, granted, Anakin only goes back after he has visions of his mother suffering. We will assume, for Anakin’s character’s sake, some unknown Jedi ordinance or rule forbade the Jedi padawan from returning any sooner to fulfil his promise. But fulfill it he does, and so we must return to Tatooine. Lucas also uses the return home as a means to not just tie up this loose end from the previous film, but to foreshadow how the loss of a loved one will drive him toward actions quite befitting a Sith Lord. Our final cinematic return to Tatooine, at the end of Revenge of the Sith, then is to seed the dusty soil for A New Hope, dispensing baby Luke into the hands of his aunt and uncle. Looking back at the prequel trilogy, we return to Tatooine for the character of Anakin, and additionally, thereafter, the momentum that’s produced by the events of the first film. 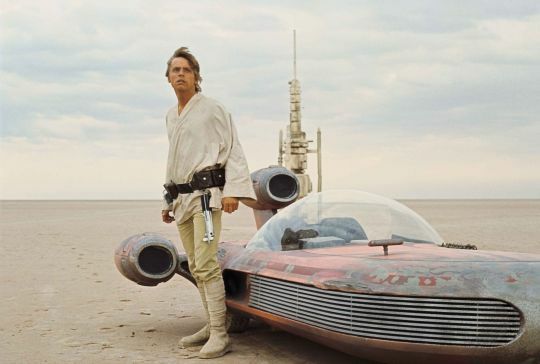 While Lucas used the geography of Tatooine to subtly reinforce the spiritual nature of Anakin Skywalker’s birth and background, his original selection of the planet may have also had to do with its geography. It’s fair to say that most movies created in the late 1970s were created with audiences in North America and Europe primarily in mind. The one thing most inhabitants of those two continents generally do not see on a daily basis are sand dunes. In fact, some would probably be surprised to learn that the Tatooine scenes in Return of the Jedi, unlike in A New Hope, were filmed almost exclusively in the Western United States. No one lugged giant lizard bones back to Tunisa for this final chapter of the original trilogy (and to be fair, they just left them there from the first time). Thus, the easiest way for Lucas to shoot the film and establish a world that felt alien and remote was to head for the desert. Most viewers lived in much greener worlds, after all. The alternative would be a land of frozen wastes, which is exactly the first setting of The Empire Strikes Back. After the break from the sand and grit in Empire, the trilogy began its final installment (of the time) in Return of the Jedi. We can point our figure directly at the last two films for Tatooine’s return or if you want, just at Han Solo. A New Hope established that Han Solo owed money to Jabba the Hutt and had a bounty on his head and The Empire Strikes Back saw that bounty collected by the dang cool Boba Fett. Once Fett escaped in Slave I with a Carbonite frozen Han, our return to Tatooine was unavoidable. That Lucas opted to go with this conclusion of Solo’s storyline begun in A New Hope may also have something to do with his decision to make the third film reflective of the first, from introducing a second Death Star to be blown up in the climatic conclusion of the film to asking Star Wars fans to consider the Luke who left years ago and who had now returned. By taking Luke back to Tatooine, he became a prodigal son of the planet (technically, after all, his only family had been slaughtered courtesy Stormtroopers on a mission to find some droids). For a number of reasons, a planet with almost no redeeming value other than spectacular sunsets, became the focal point of a star bound saga. Set in the Outer Rim, approximately as far as one can get from the bright center of the universe, Tatooine over the course of six films played an important role from establishing the alien-like atmosphere of the Star Wars franchise to reinforcing the characters of the Skywalker family who assumed the pivotal roles in both sets of trilogies. Tatooine, come for lawlessness, womp rats, and the giant overbearing criminal slugs, and stay for the eventual appearance of heroes who will affect the destiny of the galaxy.